Play for play, shot for shot and quarter by quarter, the Lake Oswego and Lincoln boys basketball teams just flat went after each other on Saturday night. Battling at Lake Oswego High School for a berth in the Class 6A state tournament, the Lakers and Cardinals traded punches and counterpunches all afternoon before Lincoln finally pulled away in the second overtime to win 82-81 in the second round of the playoffs. "It was a tough game," said Lake Oswego senior wing J.R. Schilling, who finished with 18 points in the loss. "It's obviously tough to lose at (home) in a double overtime game to get to the Chiles Center, but I was proud of our effort." 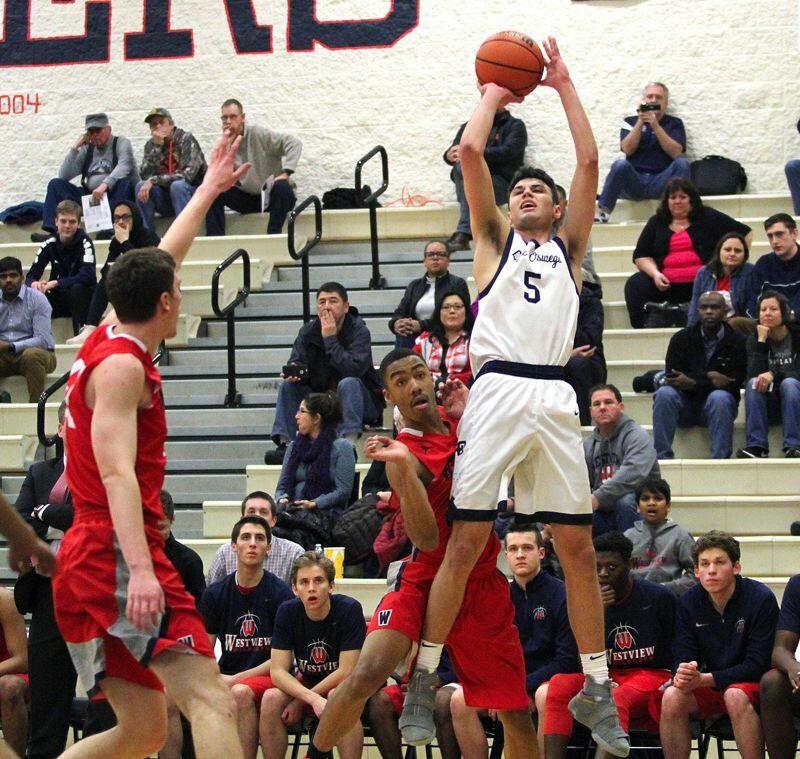 "The outcome was initially devastating because of how close our team is," said Lake Oswego junior guard Josh Angle, who scored a game-high 28 points. "I truly consider each and every one of my teammates and coaches to be family, and I think the same would be said by each member of our team." With the loss, the sixth-ranked Three Rivers League champion Lakers had their 11-game winning streak snapped and saw their season end with an overall record of 20-6. The loss also prevented Lake Oswego from winning its first state tournament berth since 2012. No. 11 Lincoln, meanwhile, won its third straight game and improved to 17-9 overall after finishing third in the Portland Interscholastic League. Next up, the Cardinals will face third-ranked Metro League champion Southridge (23-3) in the state quarterfinals at 6:30 p.m. Thursday at the Chiles Center on the University of Portland campus. Saturday's game was a slugfest from the opening tip, with Lake Oswego grabbing an early 11-7 lead following Angle's three-point play midway through the quarter (he had seven points in the period), but Lincoln closing the period on a 16-5 run to lead 23-16 at the end of the frame. The Cardinals' run started with two Daniel Kovalev hoops, two more by Aidan Anastas, two from Bryce Sloan (including a 3-pointer), and finally, a Max Weissflog "three." The Cardinals pushed their lead to 10 points in the second quarter on a pair of Michael Fortner foul shots that extended the Lincoln lead to 28-18, and it grew to 36-25 when Sloan went 1 of 2 at the line near the end of the half. "We started out slow and didn't attack the rim early, which set us back on our heels," Angle said. "We struggled throughout the game to keep them off the offensive glass and (stop them from getting) easy putbacks," Schilling said. The Lakers, behind six points from senior post Shawn Elliott and a late basket by freshman Wayne McKinney III, moved within 38-29 at the break, then played their strongest quarter of the game in the third. The Lakers' defense began to make some inroads against Lincoln in the second half, holding the Cardinals to just 12 points — five of those from Addison Phillips — and providing time to cut into its deficit. Ange and Schilling did most of the heavy lifting on the offensive end, with Angle burying a pair of "threes" and scoring eight points in the quarter, Schilling tacking on another five, and Elliott and junior Brandon Roberts four each. Together, the Lakers pieced together a 21-10 scoring edge capped by back-to-back 3-pointers from Schilling and Angle that gave Lake Oswego a 50-48 lead, its first advantage since it was 11-9 way back in the first quarter. "We dug ourselves a hole in the first half, but with resilience, we battled back as we have time and time again," Schilling said. "We just took it one play at a time and did our best to gradually cut the lead." There was more excitement to come in the fourth quarter, too. The two teams entered tied at 50-50, then took off on a back-and-forth battle that included three lead changes and three ties before Lincoln grabbed a seven-point lead late in the quarter. The Lakers trailed just 60-59 after a pair of McKinney foul shots, but from there, Sloan sank two foul shots, Anastas and Weissflog scored back-to-back baskets, Sloan hit once from the line and Kovalev twice to put Lake Oswego in a dangerous hole. Angle lifted his team back into contention in a hurry, though, knocking down a free throw while getting fouled by Sloan, then tacking on the ensuing free throw to bring his team within 69-66. McKinney followed with another hoop, and after Sloan hit once from the foul line, McKinney scored again to tie the contest at 70-70 and force overtime. Sloan and Phillips each hit once from the free throw line at the start of overtime, McKinney matched them with a pair of his own, then Weissflog and Schilling traded 3-pointers to tie the contest at 75-75. Sloan pushed his team back in front with two more foul shots, but the Lakers answered once again, with Schilling hitting twice from the line to force a second overtime period at 77-77. The Lakers led early in the second OT, too, with Schilling scoring from the field and Elliott adding a pair of foul shots to give their team an 81-78 lead. It wouldn't last, though. While the Lakers wouldn't score again, Anastas responded with a "three" to tie the game and Kovalev added a free throw for the final 82-81 margin. While obviously disappointed at not reaching the state tournament, the Lakers were nonetheless proud of their effort and their season, and grateful for the bonds they'd formed along the way. "It wasn't going to be easy to come back, but we managed to do it and force OT," Schilling said. "We had guys hitting big shots and stepping up and I couldn't be happier with the way we played and fought to the very end." "After reflecting on the season, I could not have been more lucky to have such a great group of young men to compete alongside," Angle said. For the game, the Cardinals made 29 of 41 foul shots (including 14 of 19 by Sloan) while the Lakers hit 16 of 20.